If you’re a regular at the South of the James Market, you will definitely recognize Bonny Rike of 2 Dye 4. You can find her table tucked in the unofficial ‘artisan alley,’ usually between her buddies Linda Williams of Handmade by Linda and Jane Harrison of Gypsy Eye Jane. She’s always having fun, she’s always smiling, and she’s ALWAYS wearing tie-dye. Bonny is a dyed-in-the-cotton (see what I did there?) hippie, mother of 3, and CPA. Yep, as in an accountant. 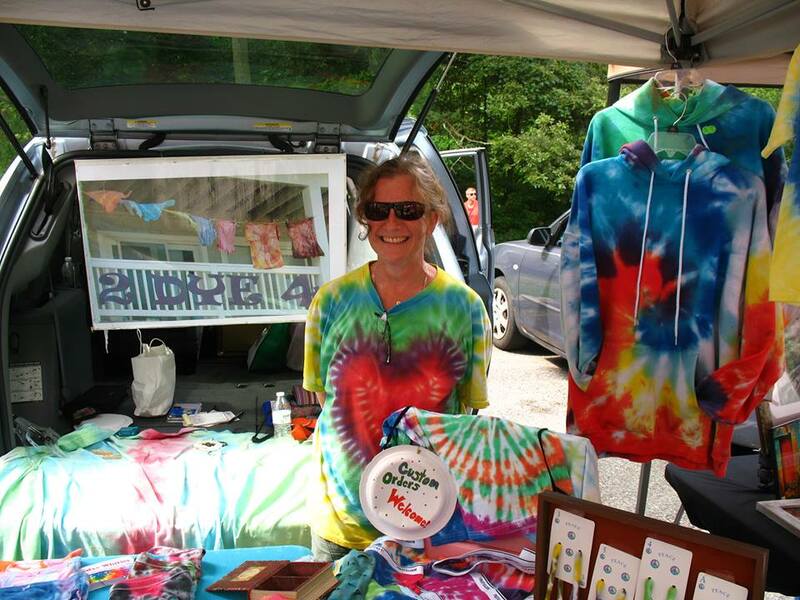 2 Dye 4 is a supplemental business for Bonny Rike, who makes her living helping creative entrepreneurs manage their finances. She’s even the accountant for GrowRVA, and she does a great job. Like, Share, or Comment on this post on Facebook, and Bonny will give one lucky person not one but 5 PAIRS OF TIE DYE SHOELACES. That’s getting ahead on stocking stuffers, that’s what that is. So spread the love, and check back on the GrowRVA Facebook page at 8:00pm to see who’s won. 2 Dye 4. Hand tied and dyed, one of a kind clothing and accessories for the entire family. I will dye anything cotton and encourage customers to bring me their old or new cotton garments and I will twist them into something entirely new. I tie dye shirts, underwear, baby clothes, skirts, pants, shorts, tank tops, hoodies, dresses, sheets, tablecloths, napkins, shoelaces, hats, socks, and more. I even once tie dyed my tent canopy. I also enjoy solid color dyeing. Currently am working on a batch of solid red clothing for a customer who dresses up as Santa Claus every year. I enjoy making gift sets for a baby with a onesie, socks, and a hat. Baby clothes, including onesies, t-shirts, socks, etc. I think these are popular because they are fun and colorful, and because there’s a little hippie in all of us! Sometimes it’s the parents wanting to bring that out in their children, and sometimes it’s friends or family wanting to introduce that element into a more conservative family. Who can resist a baby in a tie-dyed outfit? I started my business in 2006 and began vending at the 17th street market with 3 kids in tow (then ages 11, 7, and 1!) I started vending at SOJ on day one and have been there full-time ever since. It’s the perfect fun job to go along with my accounting business, which may surprise some people. 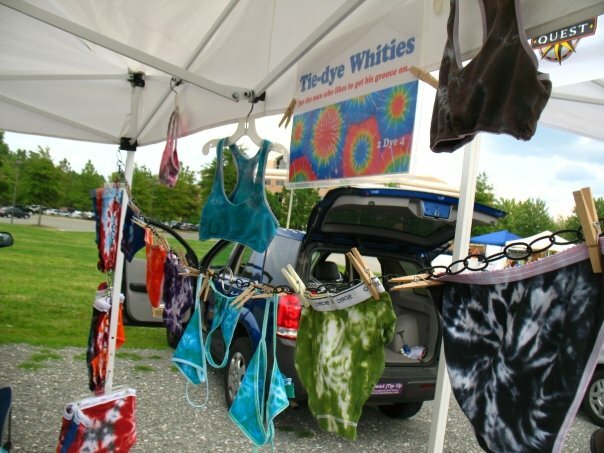 If not, my display of tie-dyed whities (underwear for all shapes and sizes) usually does the trick for first-time vendors to my space. I buy from so many vendors, it feels good to visit and trade with/purchase from so many great vendors, spreading the wealth if you will. Trading with my two closest neighbors, Gypsy Eye Jane and Handmades by Linda, has definitely increased my jewelry choices!